Affiliate marketing isn’t easy. Many have asked me “is affiliate marketing dead 2017?” Ask any digital marketer you may know; affiliate marketing is a lot of hard work. Simply put, if you’re not sweating blood on a daily basis, you’re not doing it right. If done correctly, however, affiliate marketing can earn you tens of thousands of dollars a month. When affiliate marketing was in its infancy, individuals who jumped in early made thousands of dollars with Google Adwords. As word began to get out that affiliate marketing could make you rich, the market became saturated with hundreds of thousands of individuals looking to cash in. One thing led to another and Google eventually began to punish those who used direct affiliate links. That’s when the affiliate marketing game began to change. Google no longer plays nice with affiliate websites. Google has done a magnificent job of filtering out most of these sites from the top spots when it comes to both organic and paid search results. Cash back and coupon sites are taking bigger and bigger cuts from affiliate commissions. Commissions tracking for many advertisers have become an untrustworthy affair. An ever-increasing number of advertisers don’t allow their affiliates to track their earnings. Even ISPs are on the warpath, figuring out effective ways to block affiliate promotional emails. Commissions paid out by the big companies have been slashed in a big way. Once upon a time, Amazon used to pay 15% commission on book sales. Now, count yourself lucky if you receive 2.5%. CPC costs have skyrocketed over the past decade. Sadly, most (not all) affiliate networks have made no significant advances in their technology for the past decade. Ad blocking software, used by hundreds of millions of people, block affiliate ads and tracking. As you can see, the golden days of affiliate marketing are long gone and so too are the “old guard”; those who enjoyed the benefits of affiliate marketing before things began going downhill. Many of the “super affiliates” have moved on, either retiring or opening digital marketing agencies. Those who are still engaged in marketing on the cyber front now label their businesses “performance marketing” as opposed to “affiliate marketing” as the latter term has a negative association and has been deemed as not being as profitable as it once was. Even many of the big affiliate forums, such as ABestWeb and PerformanceIn, have experienced a downtrend in engagement on their sites. Do you have a chance as an affiliate marketer in 2017? 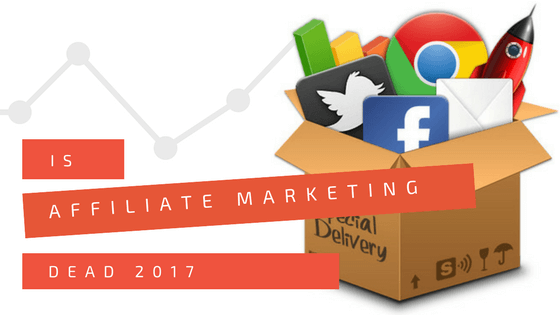 Is affiliate marketing dead in 2017? Well, that all depends on the strategies that you use. The strategies that created the “super affiliate” millionaires of the past no longer work in 2017. Affiliate marketers have begun to adapt their businesses to profit from CPC, CPM, tenancy fees and consulting. Transitioning into this new “consultancy” era isn’t something an average Joe can make happen overnight. You’re going to have to build a brand, a good reputation, and jump on the latest technology as quickly as possible. The time and energy that you spend building up your business will have to exceed the average affiliate’s business by leaps and bounds. To make it as an affiliate marketer in 2017, you’ll need diligence, patience, and financial investment. These are things that the vast majority of internet marketers aren’t willing to invest to ensure their success in the realm of affiliate marketing. In other words, this creates a fantastic barrier to entry that gives entrepreneurs with the proper amount of discipline and fortitude a leg up as they strive for success. If you’re looking to succeed in this business, you need to throw away the idea that you need to settle with just any advertiser that’s willing to work with you. A one to two dollar commission is not generous, let me assure you. That’s not even enough to pay the tax at your local dollar store. You’ll want to put real money in your pocket, and that requires researching the best advertisers who offer the most generous commission payouts. Tracking is a critical component of any affiliate marketer’s arsenal. Sadly, there are many advertisers and networks out there that don’t offer tracking features leaving their affiliates dazed and confused. The best advertisers utilize multiple forms of tracking to ensure that the sales from ‘your’ customers are attributed back to you. In an ideal situation, advertisers should continue to pay a recurring commission on all future sales made by the customers sent to them. In the affiliate marketing world, it’s common practice to redirect a customer to an advertiser, receive a payout, and never hear from that person again. However, how much money are you leaving on the table by allowing that customer to slip through your grasp? How much more money could you make if you continued to market to that person time and time again? The solution to this dilemma: build an email list. An email list creates a direct line between you and your customer. You can send them as many affiliate emails as you wish (don’t be spammy about it though) and if you have a big enough email list, ranging in the tens of thousands and larger, sending out an email can be the equivalent of going to an ATM. Ultimately, affiliate marketing is still alive and well. The industry has simply evolved over the past few decades. You can most certainly find success with affiliate marketing in 2017 and beyond, but it takes the proper mindset and fortitude to stick with your business until the very end. If you’re willing to put in the work, then there is no reason why you can’t find success with affiliate marketing. Before you leave, check out this massive list of 101+ affiliate resources!